Go ahead and share your great photo or travel expertise with everyone! TravelGumbo welcomes your contributions ! This website is designed for your active participation. 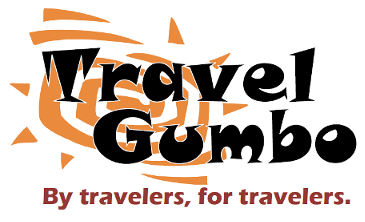 TravelGumbo is "By travelers. For travelers." Add your original pieces - such as trip reports - to our Forums. Other Members are keen to read your firsthand travel experiences and advice. The Forums are a great place to ask questions about an upcoming trip or travel-related concern. TravelGumbo both welcomes and monitors posts. Share your travel vision. TravelGumbo is looking for quality travel photos, well-written blogs and reviews. We'll acknowledge receipt of your material within a day and give you our feedback within a few days. Your terrific photos are selected and posted daily. Our goal is to try to post as much quality material as we can. "Pic of the Day" should be a single nice quality photo with a short (one page) description. Tell other travelers - Why did you take this unique photo ? What is its special meaning to you ? Your photo should be reduced to no larger than 1600 x 1200 pixels. Include a small non-obtrusive watermark on the photo, if you would like. Blog posts should be limited to around 1000 words maximum and ideally should be accompanied by a few photos (max 25). Maximum size - no larger than 1600 x 1200 pixels. Do include a brief description of each image. Those who repeatedly contribute quality material are welcomed as regular blog posters. By sending pictures or blogs to TravelGumbo, you agree to let us publish the material on TravelGumbo. It will be permanently in our archives. You retain the right to use your material elsewhere. TG will not sell, transfer or grant other people rights to your work.